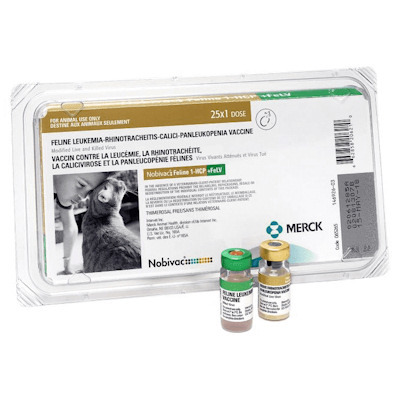 Nobivac: Feline 1-HCP (3 way) + FeLV (Merck) is a modified live virus vaccine for protection against feline herpes,Calici, Panleukopenia (cat distemper) and Feline Leukemia. Give a 1ml dose Subj. or IM to cats or kittens 9 weeks of age or older. Repeat in 3 to 4 weeks and annually thereafter.